Gladiatorial games at first served as a solemn funeral rite to honor noble citizens. At the height of their eight-century reign of popularity, the games—which constantly evolved to include new events such as combat with animals and full-scale naval battles—formed the centerpiece of a huge entertainment industry run by cunning entrepreneurs and regulated carefully by the Roman government. Professional gladiators were highly trained and often highly paid, and their ranks, for a time, included women. Slaves who became gladiators could earn their freedom in as few as four wins. They were the boxers or football players of their day. From the author of Ancient and Medieval Siege Weapons comes this eye-opening new look at one of the most popular spectacles of ancient Rome. 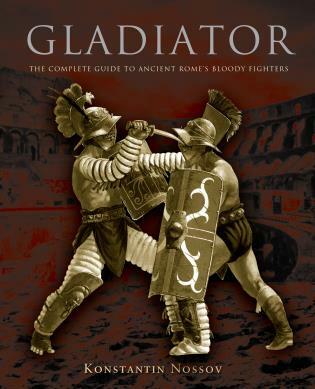 A richly detailed, fascinating guide, Gladiator provides a complete, breathtaking tour of gladiator customs and covers every aspect of the gladiator phenomenon—from the types of equipment the different classes of gladiator used, to the high place in society occupied by these sportsmen who were prepared to die. Konstantin Nossov is a noted researcher on ancient and medieval arms, armor, fortresses, and warfare as well as the author of numerous books on these subjects—including Ancient and Medieval Siege Weapons (Lyons Press).